1.What do the Medical Qualifications mean? An M.Sc. in Plastic Surgery means that the bearer has concluded all the basic training in that field. An MD in Plastic Surgery is a doctorate degree, and the bearer is registered as a consultant with the Ministry of Health. A University Professor means that bearer is the top in his field, teaches both undergraduate and postgraduate students, examines them, supervises research. and has his own school in his field of expertise. meaning that the bearer is an expert in that field, and this degree has unanimous international recognition... at the same level as the US Board Certification. The bearer describes new surgeries, examines candidates, reviews research, and teaches trainees worldwide. There are many hospitals in Cairo of the highest standard. Carefully selected hospitals conform to international standards of cleanliness and hygiene, equipment, health and safety, as well as those of technical expertise. Many hospitals have international certification (e.g. ISO9001) or collaboration with US hospitals (e.g. Cleveland Clinic). 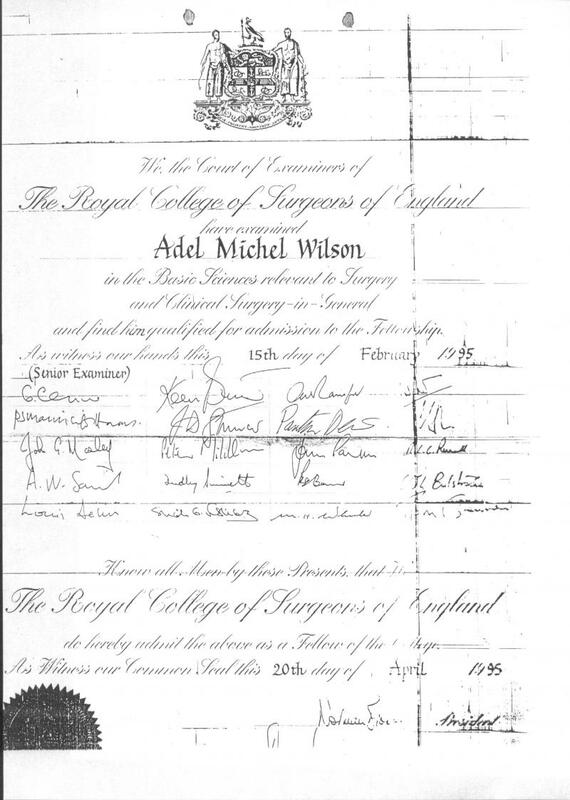 Dr. Wilson does not operate in any hospital without these credentials. 3. What type of anesthesia will I need for my procedure? More than 70% - 80% of plastic surgery procedures can be done with local anesthesia. That includes liposuction, face lifts, hair transplantation, scar surgery, eyelid surgery, and many others....etc. This is the worldwide figure, and the very same figure quoted from the Cairo Plastic Clinic statistics. Only very major procedures (20-30% of all plastic surgeries) necessitate general anesthesia. 4. How long should I stay in hospital? With the technical expertise and surgical excellence, more than 90% of the procedures Dr. Wilson performs are day case surgeries, i.e. you go home on the same day! These includes face lifts, liposuction, nose jobs, neck surgery, ear surgery, all breast surgeries, hand injuries, scar revisions ...etc. In the remaining 10%, you might need to stay overnight in the hospital e.g in body lift. 5. How much time do I need off work? It depends on the procedure! For small procedures 2-3 days would be sufficient but for more extensive or multiple procedures you would need 4-7 days. <!--[if !supportLineBreakNewLine]-->An exception to that rule is a nose job with bony work where you would need 10-14 days off work. 6. How long will it take me to recover? If you mean by recovery: feeling well and being able to carry on your daily routine, well for most surgeries 2-3 days are enough. But if you mean by recovery meeting people without having any evidence of surgery, then for a filler injection consider 24 hours, for a breast augmentation, consider 2-3 days, for a face lift consider 7-10 days, and for bony nose job consider 10-14 days. Remember that with the modern state of the art surgical techniques, recovery time has been reduced markedly. This is different from complete healing of the tissues, which takes between 6 to 12 months depending on the surgery you undergo. This should be remembered when evaluating the end result after surgery. 7. How do I book a consultation? You can start by calling the secretary, and she will inform you of the available dates. You can then arrange to send someone to book that date. If you are living outside Cairo, you can book directly by phone. Then you need to confirm your booking by paying through our Secure Online Booking page. 8. How should I prepare myself for the consultation? Prior to your consultation, Dr. Wilson recommends that you list the top three things that bother you about your appearance as well as three things you like. He also suggests you bring photographs of yourself from 10 to 15 years ago if you are planning on having rejuvenation surgery. 9. How punctual are the appointments? The Clinic has a very strict policy in limiting the patients' waiting time before the consultation to less than 20 minutes, so please make sure you come on time for your appointment. 10. Can I see computer generated pictures of the anticipated results of my surgery? Yes, but it will be at a different appointment, usually 7-10 days down the road. 11. How much will my surgery cost? Well, you have to see Dr. Wilson first, and he needs to decide what surgery you need, type of anesthesia, ancillary procedures, preparation for surgery, ...etc. Then you will meet with the patient coordinator who will tell you the exact cost and payment details. However, don't worry... Dr. Wilson never lets financial reasons come in between him and his patients. Please do not ask for online quotes, it is not the policy of any respected medical establishment to offer them! 12. I'm a foreigner, how long do I need to stay in Cairo for my procedure? For the great majority of procedures, 1 week is enough. Dr. Wilson recommends you come ready for the procedure and have it done the very next day after your arrival. Then you can spend 4-5 days enjoying the tourist attractions, sightseeing and traveling across Egypt. Then at the end of the week; visit us to remove any stitches..etc. , before you fly home .